However, looking back four decades, the country has had its share of famine, natural disasters, and hunger. From 75 million people at independence in 1971, the country’s population is estimated at a little more than 160 million now. FAO reports that more than 40 million of this total are hungry and undernourished. Among the many organizations helping the nation’s “rebuilding process” in the 1970s, IRRI made remarkable contributions to the country. IRRI’s collaboration with Bangladesh dates back more than 30 years. The two have collaborated on rice research resulting in Bangladesh making some big leaps in rice production. The total area affected by drought in the country is estimated at 650,460 hectares. The map below shows the drought-stricken areas. Partners in Bangladesh conducted R&D activities from 2009 to 2013: from line selection, screening, and testing to validation at various sites. Seedbed management options for better drought tolerance of wet-season rice and nutrient management were also studied. Although rice typically grows in standing water, it will drown like any other plant when hit with severe flooding. In Bangladesh, submergence-affected rice areas are estimated at 884,250 hectares. Four million tons of the nation’s rice production, combined with that of India, enough to feed 30 million people, are destroyed by floods every year. The total rice area affected by salinity is estimated at 2,102,380 hectares in Bangladesh. Drought. Partners conducted two PVS activities at three sites: Godagari Rajshahi (stress), Paba Rajshahi (stress and control), and Kushtia (rainfed). The control condition was found at the BRRI Regional Station. The field trial in Kushtia was held to evaluate and select drought-tolerant rice germplasm suitable for northwest Bangladesh. Seedbed management options for better drought tolerance of wet-season rice and nutrient management were also studied. Submergence. Bangladesh released four submergence-tolerant varieties: BINA dhan 11 (2013), BINA dhan 12 (2013), BRRI dhan51 (2010), and BRRI dhan52 (2011). Three on-farm PVS mother trials were carried out in the northern districts of Gangachara-Rangpur, Aditmari-Lalmonirhat, and Sayedpur-Nilphamari. Baby trials. Four submergence-tolerant genotypes (IR64-Sub1, Ciherang -Sub1, BRRI dhan51, and BRRI dhan52) were evaluated in farmers’ fields in submergence-prone areas. Expansion and dissemination of Sub1 varieties. Seeds of newly released Sub1 genotypes such as BRRI dhan51 and BRRI dhan52 were distributed in farmers’ fields in submergence-prone areas in Rangpur and Lalmonirhat districts through a GO and NGO. 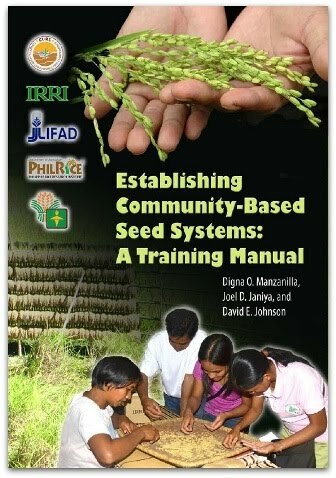 On-station seed production activity for the dissemination of Sub1 varieties. 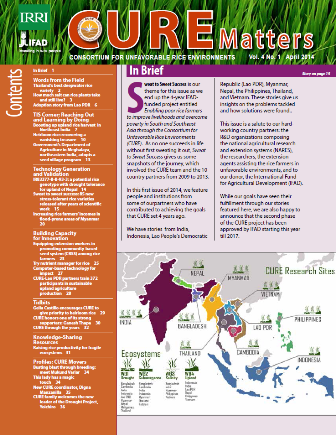 Seeds of newly released Sub1 genotypes such as BRRI dhan51 and BRRI dhan52 were transplanted on on-station farms for distribution in the next aman season (2013) in submergence-prone areas through GO and NGO assistance. Management options. BRRI, Rangpur. The effect of crop establishment methods for higher survival, recovery, and yield in flash-flood-prone areas was studied by using BR11-Sub1 and BR11 (check variety) under DSR and TPR (single and double transplanting) conditions. Salinity. At BRRI Bangladesh, in aus, 427 progenies and 8 genetically fixed lines were selected from pedigree nurseries. A total of 14 lines were selected from yield trials considering better performance than others in salinity-stressed fields. Some 357 progenies were selected from 37 F2 populations. Some 435 progenies and 2 genetically fixed lines were selected from pedigree nurseries. Three genotypes, BRRI dhan54, IR78769-3R-B-51, and BR7216-2B-26-2, were selected as promising from PVS trials and 6 lines were isolated from an INGER nursery for salt tolerance. Participatory varietal selection (PVS). Partners generated, evaluated, and validated salt-tolerant rice through five experiments (2011-12) that ran across several hybridization studies and six participatory varietal selections. Seven batches of PVS were made at seven sites in Satkhira with two PVS conducted on the BRRI farm. The number of farmers participating in all of these PVS totaled 210 (140 males and 70 females). Moreover, two batches of PVS activities were carried out: one on the BRRI Farm in Satkhira, which involved 31 farmer-partners (10 females and 21 males). The second PVS was carried out in Assasuni with 30 farmers (20 males and 10 females).